HAMILTON -- Family members of a slain man dissolved in tears Wednesday as a police officer told court about finding two bones inside an incinerator -- a substantial apparatus emblazoned with the word "eliminator" -- on a farm owned by one of his accused killers just days after Tim Bosma's disappearance. Sgt. Annette Huys's testimony left much of Bosma's family, including his widow, Sharlene, weeping as the forensics officer methodically pored over photographs of the remains found in the incinerator. Huys testified she was on the farm owned by Dellen Millard in Ayr, Ont. to execute three search warrants as officers continued their hunt to find Bosma. 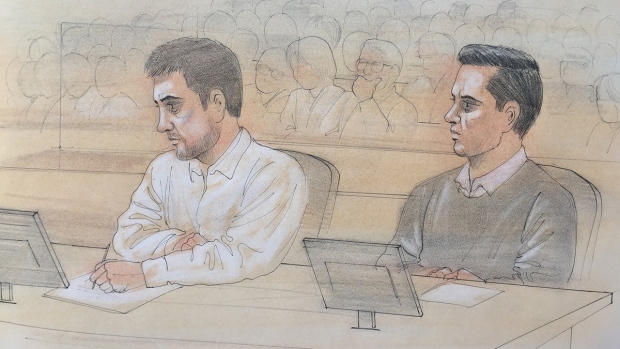 Millard, of Toronto, and Mark Smich, of Oakville, Ont., have pleaded not guilty to first-degree murder in Bosma's death. Bosma disappeared on the night of May 6, 2013, after taking two strangers on a test drive of a black Dodge Ram pickup truck he was trying to sell. His body was found more than a week later burned beyond recognition. The Crown alleges Bosma was shot inside his truck and later his body was burned in an incinerator. Huys says she was led to the incinerator along with two other officers after stopping a motorbike rider who was wheeling around the property. "When I first looked down I saw a bone," Huys told court as she described opening the latch on the massive machine that she estimated was about 3.5 metres tall. Earlier in the day, Chaz Main told jurors he was riding his bike on May 10, 2013, when he came across a "big redneck smoker" on the sprawling property. Main said the incinerator was on a heavy duty trailer with a large propane tank. It was so unique, he testified, that he had to take a photograph so his friends would believe what he found. Court saw that photograph, which shows the word "eliminator" in red letters on the black machine. Main testified that he returned to the sprawling farm near Waterloo the next day for more riding when he was stopped by police officers scouring the property as they searched for Bosma. "I told them about very odd activity and a big redneck smoker in the woods and an excavator in the swamp," Main said. Sgt. Michael Benjamin Adams, meantime, testified he was on Millard's farm that day executing three search warrants in an effort to find Bosma, his belongings and his truck. Millard was arrested a day earlier. Main said after speaking with Adams, he rode his dirtbike back to the tree stand to show the officers the incinerator. After that, he went to show the officers the other machinery when they came across several large "burn spots" where the ground had been scorched. He said he had never seen the incinerator before and it wasn't there two days prior. He also told police about an excavator and a "skid steer" that was stuck in a swamp on another part of the property. Under cross-examination from Millard's lawyer, Nadir Sachak, Main said those two machines had been on the farm since the previous winter and appeared to have become stuck in the swamp.